I am here at a hanggliding competition which is being held at a place called Dalby which is 3hrs drive west from Brisbane into the farmbelt hinterland. 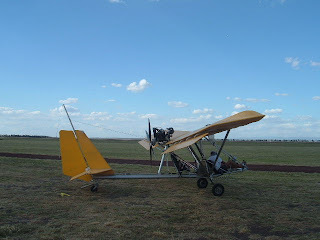 The photo is of the dragonfly which is a motorised plane wich can tow hanggliders into the sky, the other is looking outside of the hangar. I shall be here for the next week staying in a motel in the town. 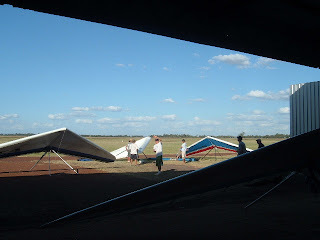 Some of the top hangglider pilots from Australia are here. Today was a practice dayand some flew 100km triangle flights and landed back at the airfield. The sky really looked beautiful with perfect cumulus clouds for as far as the eye can see from horizon to horizon. This really is a country made for flying big distances.